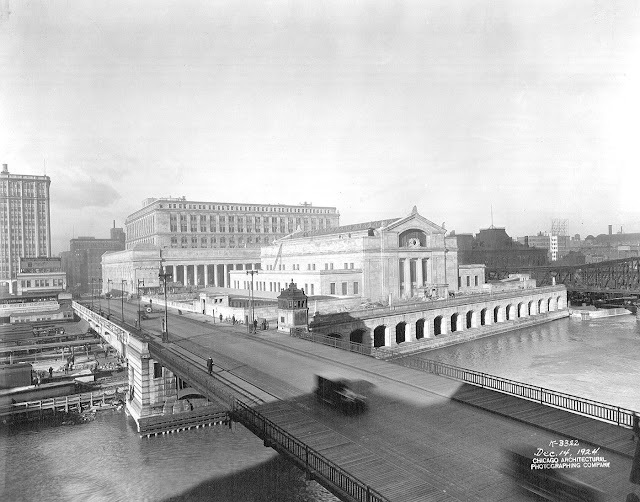 August 28, 1986 – The Chicago City Council approves a plan to build two 25-story office towers on top of Union Station at Adams and Canal Streets. Alderman Gerald McLaughlin of the Forty-Fifth Ward, the chairman of the landmarks committee, says that the train station does not hold landmark status and that the developers of the property have promised to retain much of its historical design. 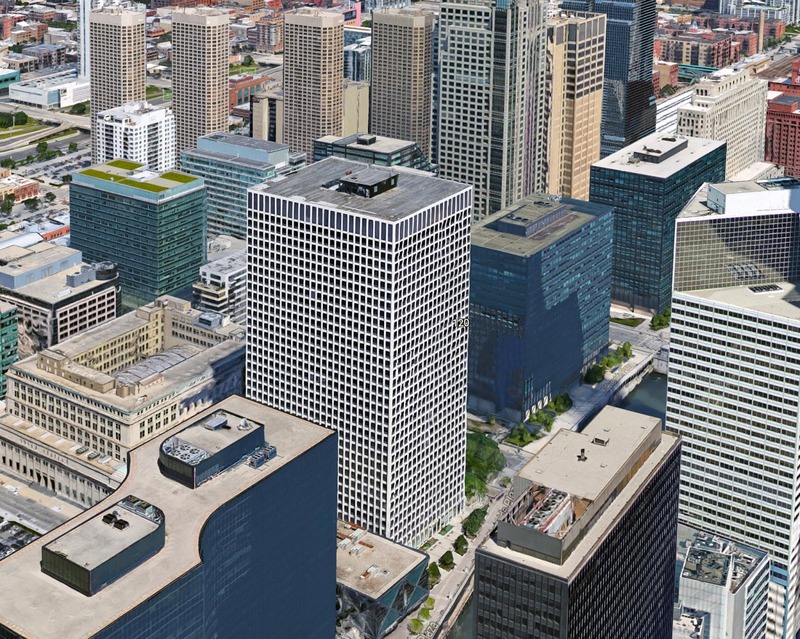 In an editorial, the Chicago Tribune says of the plan, “… we continue to believe that these plans will contribute importantly to the revitalization of the west Loop. New rail facilities, new and renovated shops, restaurants—retail space that the area needs so desperately—and office space will draw people to the building’s dramatic waiting room and create an exciting destination point without destroying either the station’s main waiting room or its walls.” [Chicago Tribune, September 4, 1986] All of the meetings, plans, and protests came to naught, however, and the plan died. 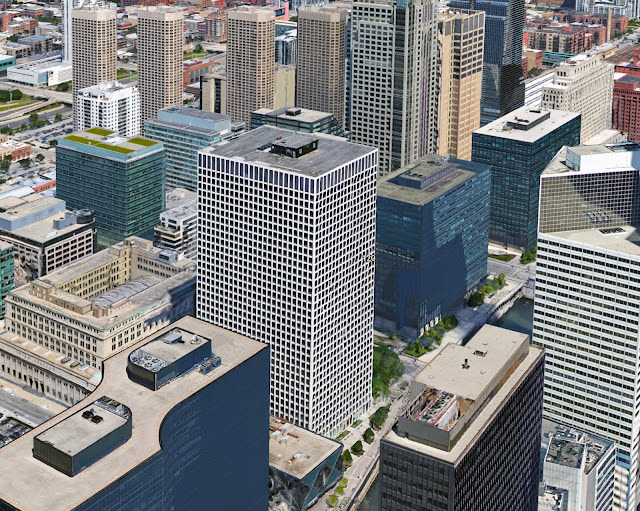 About ten years ago the American Medical Association proposed the construction of an 18-story office building and hotel above the station, but that plan fell apart as well. This spring Riverside Investment & Development was named to head up a three-phase $1 billion (or more) project that is expected to include up to two million square feet of office space, 780 apartments and 350 hotel rooms that will be constructed in three phases, starting sometime in 2018. Riverside CEO John O’Donnell says of the project, “This is probably one of the best physical locations in the city. It just needs to be dressed up, and I think it needs to have a number of amenities that don’t exist right now. We can bring an abundance of those to this location.” [Chicago Tribune, May 25, 2017] The two photos above show the station as it was originally constructed and the Riverside Investment & Development rendering of what it may look like in the future. In the more recent photo what is left of Union Station is at the left central portion of the photo. 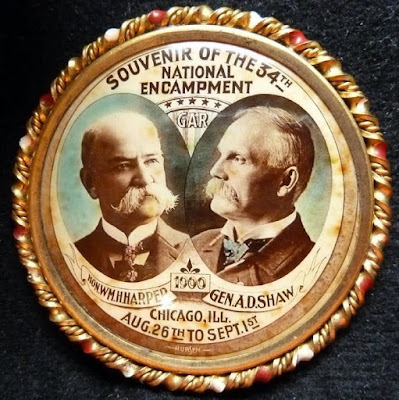 August 28, 1900 – For five hours “in ranks twelve deep, the white-haired veterans of the Grand Army of the Republic passed in their last grand parade . . . Never again can they meet in such numbers. They are growing gray haired and aged, and gradually death is mustering them out. But yesterday they marched 23,000 strong through the down-town streets of Chicago . . .” [Chicago Daily Tribune, August 29, 1900] Beginning at 10:00 a.m. the veterans of the Union Army march down Michigan Avenue until 3:45 p.m. Commanding General of the Army Nelson A. Miles, upon reviewing the ranks, says, “It was a parade which all Europe, with all its armies combined, could not duplicate. It was a spectacle which perhaps no American shall witness again.” Although the 23,000 attendees make up only a small portion of the 2,880,000 men who fought, the encampment of the Grand Army of the Republic taxes the city’s resources. Trains bring 195,000 people to six different railroad stations. Elevated and surface line trains handle 725,000 passengers on the night of August 28, and 140,000 people arrive in the city on the day before the parade, putting a huge strain on hotels.